Celebrating the life of Franklin Stevens, Jr.
Be the first to share your favorite memory, photo or story of Franklin. This memorial page is dedicated for family, friends and future generations to celebrate the life of their loved one. Obituary for Franklin Stevens, Jr.
Franklin Stevens Jr. (AKA) Gas was born March 3,1938 to the late Frank Stevens and Frances Stevens in Lakeland Fl. He was preceded in death by Frank Stevens (father); Frances Stevens (mother); Wade Stevens (brother); Alexander Stevens (brother); Naydene Fields (sister); and Grace Stevens Hadley (sister). In 1958 Franklin married Annie Louise Horton the love of his life. Their marriage produced 6 children and three out side the marriage. Frank Stevens (deceased) Linda Johnson (Robert) of Lakeland, Albert Stevens (Deidra) of Lakeland, Michael Stevens of Lakeland, Cynthia Harper (Adrian) of SC Carolina, Frankie Mae Stevens of Lakeland, Beverly Thomas (Clifford) of Lakeland, Angela Dixon (Ronnie) of Atlanta Ga, Shelby Stevens of Bartow, and God son Alexander Stevens of Lakeland. Franklin love cooking his lima beans and ham hocks. He could not do without his vanilla ice cream double mint chewing gum and peppermints balls. Wrestling was his favorite and old western movies. He could listen at Heat of the night all day all and tell you what is going to happen because he heard every episode over and over. Franklin Stevens worked for City of Lakeland at the Coleman Bush Building until he retired in 1990 after working for the city for 25yrs. If you asked, anybody he thought Coleman Bush building was his own building you did not treat that building any kind of way. Was a faithful member of the Sixth St Church of Christ he served on the church program until he went legal blind was not able to serve on the program but that did not stop him from serving his God. He leaves to cherish his memory his loving wife of 60 yrs. nine children, one sister Elnora Bennett, one brother Moses Stevens both of Lakeland Fl. 22 grandchildren, 37 greatgrandchildren, 1 great great grandchild and a host of nieces, nephews and friends. To send flowers or a remembrance gift to the family of Franklin Stevens, Jr., please visit our Tribute Store. 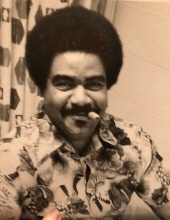 "Email Address" would like to share the life celebration of Franklin Stevens, Jr.. Click on the "link" to go to share a favorite memory or leave a condolence message for the family.